Premier Doug Ford provided Niagara West with an early Christmas present Wednesday morning – committing to the long-awaited West Lincoln Memorial Hospital rebuild. 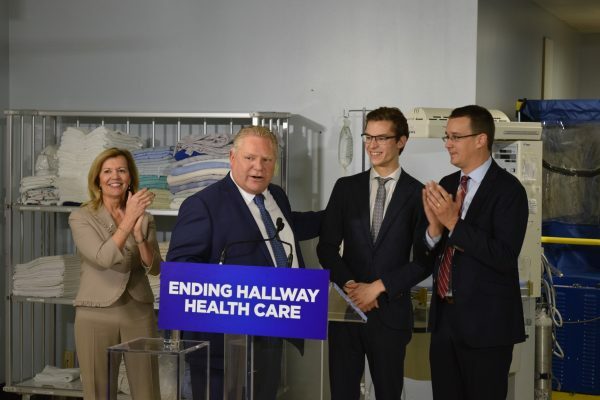 Ford, Minister of Health and Long-Term Care Christine Elliott, Minister of Infrastructure Monte McNaughton and Niagara West MPP Sam Oosterhoff were all part of announcement which included several components. While a $500,000 commitment to the capital planning process for the rebuild and following through on an old Liberal promise for $8.6 million in infrastructure upgrades were part of the mix, his comments on the rebuild itself is what everyone wanted to hear. “We’re going to build you a new hospital, right here,” Ford told those at a press conference. While everyone wants to know when the shovel will go in the ground, Ford said that was premature as there are still major steps in the planning process to execute, but he said it will be as fast as good planning will allow. “You know us,” he told the crowd.